Akatsuka Pond Park (赤塚溜池公園, akatsuka tameikekouen) is located Itabashi, Tokyo. It is a ruins of Akatsuka Castle. This pond park has beautiful Bairin, Japanese Plum Forest. 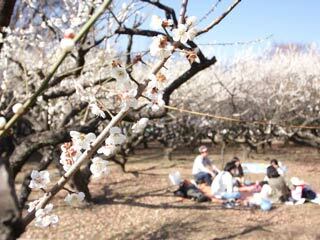 About 200 Plum trees in this park, and they bloom in early March. There is a festival when Ume blooms. There is restroom but no parking. 1. use Tobu Tojo Line to Narimasu. Great spot for Ume Hanami party. ... was built in 1456 by Chiba Yoritane. However, it appears in the record of Minamoto no Yoritomo. When Toyotomi Hideyoshi defeated Hojo clan, Akatsuka Castle was abandoned.